Goods In Transit, 4th Ed. now available! 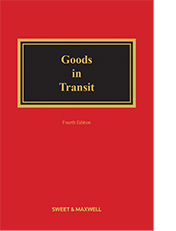 The updated 4th Edition of “Goods in Transit”, authored by our own Paul Bugden (London) and Dr. Simone Lamont-Black (Edinburgh), is now available for purchase from Sweet & Maxwell.